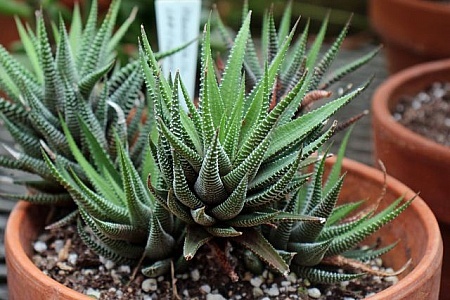 Succulent plant Haworthia Attenuata or Zebra Plant, Zebra Haworthia, Apicra Attenuata, and Aloe Clariperla is a family of non-cactus plants that live in the desert of South Africa. This zebra plant is growing in a small clay pot inside a greenhouse at Deep Cut Garden in New Jersey. 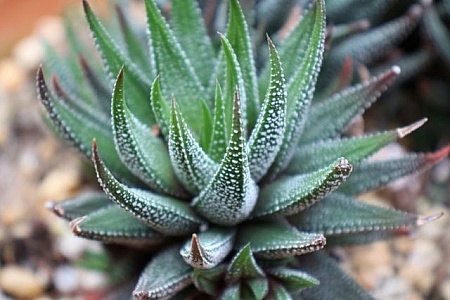 Closeup of a succulent plant Haworthia Attenuata or Zebra Plant, Zebra Haworthia, Apicra Attenuata, and Aloe Clariperla is a family of non-cactus plants that live in the desert of South Africa. This zebra plant is growing in a small clay pot inside a greenhouse at Deep Cut Garden in New Jersey.